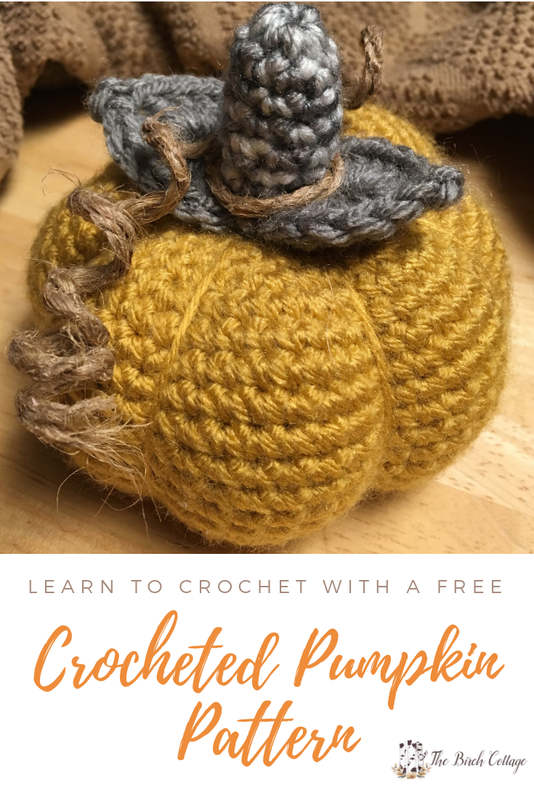 Learn to crochet a pumpkin with this free crocheted pumpkin pattern. This crocheted pumpkin adds the perfect handmade touch of autumn to your home decor! I shared my little creation on Instagram and several people were interested in the pattern, so I thought I’d try to get it written down and share it here with you. I’m a little hesitant to share my pattern with you because I’d like to do a little tweaking to it, but who knows when I’ll get around to that! So, if I do modify this pattern, I’ll be sure to update it below. Of course, you can use any colors you want for your crocheted pumpkins! I also just used jute twine for the vine or tendril. Please note that this post contains affiliate links. If you click on a link and make a purchase, I may make a small commission at absolutely no additional cost to you. I crocheted the whole little pumpkin in a couple of hours. Hopefully, with written instructions, I could crochet more in less time! 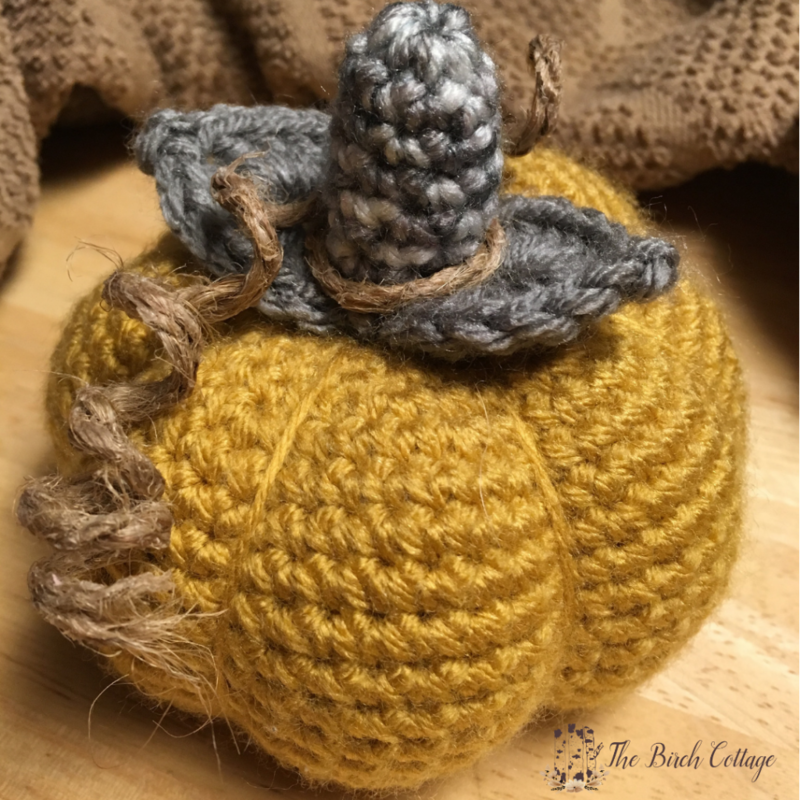 This little pumpkin is crocheted in rounds, starting with a magic circle or ring. If you need help making a magic circle, you can follow these instructions or watch this video. Using the Sungold or color of your choice for the pumpkin, make a magic circle. Stuff the pumpkin before crocheting the last round. Fasten off, leaving a long tail (2-3 feet) for sewing. Add any additional stuffing to your pumpkin. Sew a gathering stitch to close the opening in the pumpkin. Thread the needle up through the middle of the pumpkin and out the other end in the middle. Wrapping yarn around the outside of the pumpkin, thread the needle back through the opening and out the other side, pulling taut on the yarn. Repeat this seven more times so that you have eight sections in your pumpkin. Knot the yarn to the bottom of the pumpkin and fasten off. With the Eagle Gold Print (or yarn color of your choosing) make a magic circle. At the end of round 7, sl st to next stitch and finish off, leaving a long strand for attaching the stem to the pumpkin. With the Graphite (or yarn color of your choosing) *chain 8 and join to form a circle. Leaf 1: Work the following in the circle just made: ch 2, 6 dc, ch 3, st st to 1st ch, 6 dc, ch 2, sl st* Do not fasten off. You have just made the first leaf. Leaf 2: Repeat from * to * to make the second leaf. Fasten off, leaving a long strand of yarn for attaching the leaf to the pumpkin. 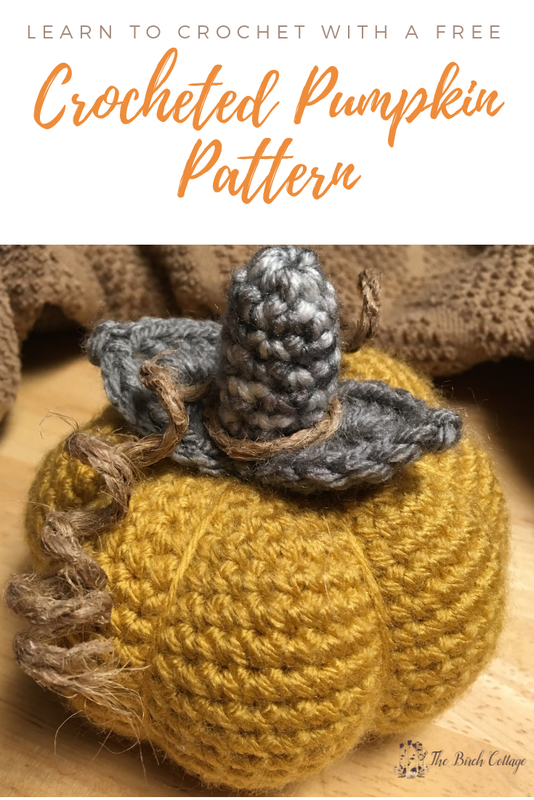 With your darning needle, attach the leaves to the top of the pumpkin using the long strand of yarn you left attached to the leaves. Fasten off and trim yarn strand. Attach the stem to the top of the pumpkin and leaves using the long strand of yarn you left attached to the stem and your darning needle. Fasten off and trim yarn strand. Take about a 12″ long piece of twine and wrap it around a pencil. Spread glue all over the twine and allow to dry. Remove from the pencil once dry. I simply wrapped the twine vine (hey, a rhyme) around the base of the stem. You can hot glue it in place, if you desire. 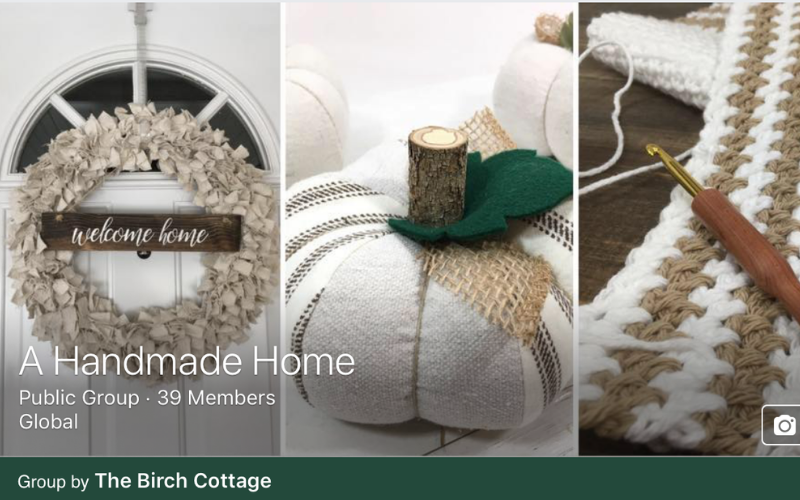 If you crochet one of these pumpkins, be sure to share over on The Birch Cottage’s Facebook Group – A Handmade Home and share your inspiration with others! If you have a picture to share, that’s even better!